Tagsmart CERTIFY : DNA labelling tech adopted by Marc Quinn, Mat Collishaw, Idris Khan and Gary Hume. Tagsmart CERTIFY is a unique, technology-driven platform that delivers a secure and verified solution to artwork security for the global art market. Developed by leading framer Mark Darbyshire and product designer Steve Cooke, Tagsmart meets the needs of the art world in the digital age. Over the 20 years spent in the framing and art fabrication business, it became clear to Mark that there was a real demand for increased accountability within the art market. Art buying patterns are evolving; the growth of online sales channels and emerging markets has opened up a traditionally closed-off market to a much broader audience, and investment buying is on the rise. The globalisation of the art market and the ease with which artworks can now be purchased raises serious issues of traceability, trust and authenticity for both artists wanting to protect their creative rights and collectors wishing to purchase with confidence. The value of the global art market is expected to exceed €95 billion by 2021, while online market sales in 2015 reached $3.27 billion, up 24% from 2014.Continued market growth is dependent on buyers’ confidence, which is clearly under threat with over 60% of collectors citing the fear of buying a fake as a key inhibitor to purchasing art online. 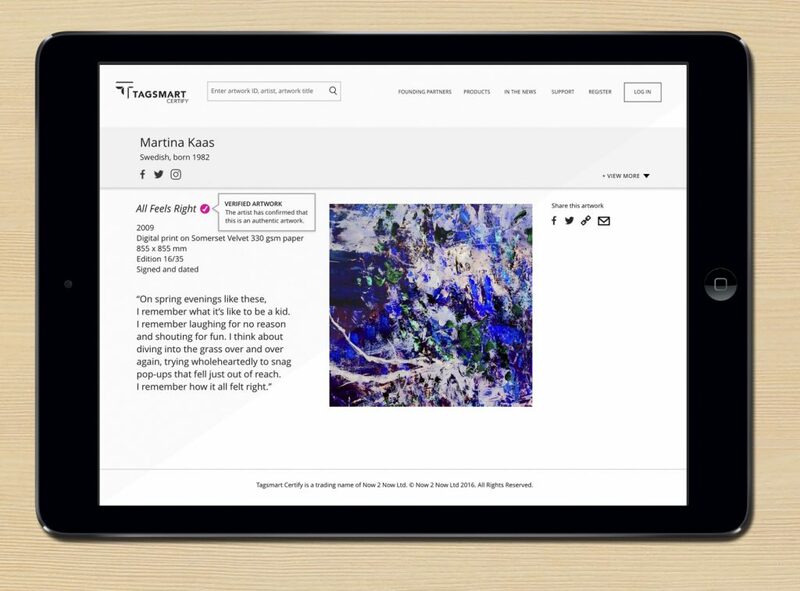 Tagsmart’s new CERTIFY platform tackles the issue of buyers’ confidence head on, and offers artists, gallerists and print publishers a completely unique approach to artwork security in a single solution. The CERTIFY platform is composed of three main components: a physical label, a certificate of authenticity and a digital passport. The label acts as the delivery system for a sophisticated digital archive, which identifies and authenticates individual artworks. 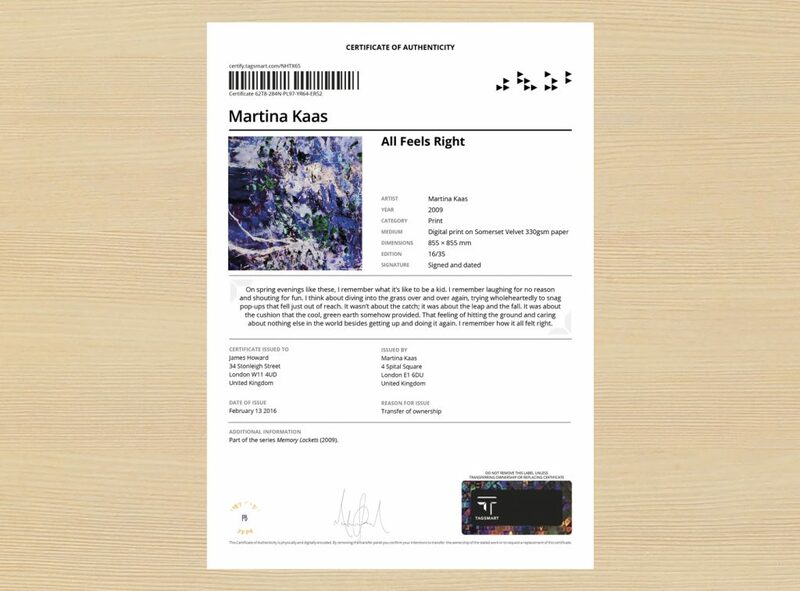 The forensically verifiable label authenticates the artwork, the secure certificate of authenticity provides proof of ownership, whilst the Digital Passport with curated content direct from the artist or gallery, provides the collector with the means to create a digital provenance record. CERTIFY provides an irrefutable chain of information about the artwork to prove its authenticity. Ahead of the platform’s launch, CERTIFY has already been endorsed by leading contemporary artists including Marc Quinn, Mat Collishaw, Idris Khan and Gary Hume, with others set to join. Tagsmart’s CERTIFY solution offers artists, gallerists and collectors a completely unique approach to artwork security, and is an essential tool for unlocking continued growth in the global art market. This entry was posted in TECH and tagged Tagsmart. Bookmark the permalink.